Destiny 2, in the long-term, has not been a fantastic time. It might sound strange, hearing that from the guy who gave the game a volcanically enthusiastic 5/5 score in our review, but launch-window Destiny and endgame Destiny are two rather different experiences. It’s one thing to provide the scale, narrative, level design, gear, grind, and refreshed PvP to keep things exciting for a month, but maintaining that excitement as a game transitions into the long-term hobby phase over the following weeks, months, and years is a process with very specific requirements. And as time has gone on, Destiny 2 has proved rather lacking in delivering on them. It’s no secret that the louder, more engaged parts of the Destiny community have been saltier than the Dead Sea of late. 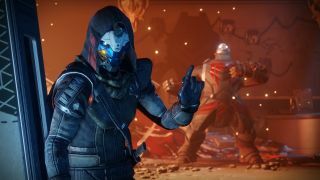 The once ebullient DestinyTheGame Reddit has felt more like a morose support group over the last couple of months, and during Christmas, Bungie’s official forums were buried under pages and pages of identical ‘Remove Eververse’ protest posts. The Eververse – Destiny’s real-money microtransaction store for cosmetic items and accessories, which has existed in various forms since mid-way through the first game’s life – has been the biggest target for vented frustration, having transitioned from being a small, buy-what-you-want store in the original Destiny into a loot-box gamble in Destiny 2, with a vast number of items now locked behind its doors. Of course the current furore over loot-boxes in general has made the Eververse the most vitriolically attacked element of Destiny 2, and as such the store’s place in the game is right at the top of the massive list of incoming improvements Bungie posted in its new dev update yesterday. But there are other things that need addressing. Things that, in my many-hundred-hours-of-Destiny experienced mind, are a much bigger deal than whether Destiny 2 pushes too hard to make me pay for that special, shiny Sparrow bike. I splurged out a mighty torrent of tweets on these matters yesterday, before Bungie’s update hit its blog. You can plough through the whole thread here if you like, but I’ll give you the TL; DR right now. Basically, Destiny 2 has a much lighter sense of meaningful, RPG progression than the first game. Weapons and armour – including Exotic-tier items - have been greatly watered down in their perk-based functionality, and character skill-trees have been heavily simplified in a way that gives much lesser control and ownership over progression paths and playstyles. And with weapons now dropping with pre-determined, locked perk selections – as opposed to the first game’s method of randomising perks, to allow greater variety and value in the long-term hunt for favoured versions – the joy of subjectively appraising nuanced versions of gear in relation to personalised needs and tastes has been replaced with a system of objectively good or bad gear. Here the canon quality of different weapons is immediately clear, and load-outs rarely vary between players. PvP players are also upset that the new Crucible’s longer time-to-kill (TTK) in firefights has led to a much safer, more monotone team-shooting dynamic, with drastically reduced room for any dynamic improvisation, or the many glorious hero moments that defined the first game. Plenty of other issues abound too, but the above are the fundamentals. Ultimately, in contrast to the previous game’s expansive journey of possibility (which went both deep and wide with things to chase) and game-changing, autonomous ways to use them, Destiny 2 feels very much locked down. There are fewer ways to hunt down gear that, ultimately, doesn’t have much of a tangible purpose beyond being collected. Destiny 2, in the moment, is one of the most beautifully crafted FPS around. Its audio-visual design is never less than stunning, its gunplay is the best in the business, and when it all comes together, solo or in co-op, there’s no other shooter experience like it. But we need better reasons to keep playing. After one of the most ferocious video game firestorms I’ve witnessed in quite some time, Bungie has responded. And it has responded big, with a mammoth list of planned changes and improvements, all of them stemming straight from the omni-directional sodium fountain that has been the furious (but knowledgeable) Destiny community since last autumn. Every area of the game, and every community criticism, has been addressed to some degree. After a frustrating stint of quietness from the studio – perhaps the result of the Christmas break, perhaps surprise at the scale and depth of the backlash, perhaps both – the gates seem open, and Bungie is pledging frequent communication from here on in. As it frequently does. For now, let’s assume that things are on the right track here. But of course, much like with Destiny 2 itself, we must look not just at the very welcome scale, but also the depth, if we’re going to appraise how promising the plan is. As I said earlier, Eververse changes are front and centre, with a pledge to put more rewards in actual, in-game activities moving forward, while providing more gameplay paths to accrue the store’s Bright Engrams. There are also guarantees that more special gear from limited-time events will be available through play, without the kind of microtransaction push that poisoned the Christmas Dawning festival. And in the update’s second, ‘so in-line with requests it could have been pasted from Reddit’ move, we’ve been told that a D1-style, 6v6 Crucible mode will appear to appease those missing the unrestrained carnage of the old days. There’s a lot more. D1-style Strike scoring systems and gameplay modifiers are coming to Nightfall Strikes. Event rewards are becoming more specific and chaseable across the board. Raid gear is getting proper Raid perks, private matches and ranking are coming to PvP, and there’s a promise of better endgame progression routes throughout. In short, it’s as big, bold, and boisterous a showing of goodwill as Bungie could possibly have dropped in one blog post. We can pontificate all day over the ups and downs of the fact that it had to happen at all, but the fact is that it did, and it’s ostensibly packed with good things. So why am I not feeling the giddy blend of joy and relief that I should be? Well ultimately, it’s because I’m still not feeling quite reassured about what I see to be the real root of the issue. Because I’ve been playing Destiny long enough to know that whatever bells and whistles come to the experience, however many extra modes hit the Crucible, the engine that keeps the Destiny experience alive and compelling is the systemic sandbox running underneath. And while sandbox and balance passes of course feature in Bungie’s dev update, they’re mentioned in unknowably vague terms compared to a lot of the more attention-grabbing matters detailed. And really, to be completely comfortable with where things are going, the next thing I need to know is Bungie’s exact intent. 6v6 Crucible, for example, sounds great, but if the current, high-TTK, team-fire focused shooting mechanics remain, then we’re just looking at a whole lot more team-fire, not less. New styles of gameplay in Nightfall strikes will get me immediately back into those playlists, but if the gameplay options within my own Guardian’s abilities don’t expand in parallel, then the thrill will be short-lived. Ditto the incoming explosion in better defined roots to more specific loot. Bungie’s promised overhaul to Destiny 2’s weapon and armour modification systems is something I was specifically hoping for, as a means to personalise and diversify the ways I can play, but without detail right now, I can’t know for definite how exciting that loot might ultimately going be when I get it. If Destiny 2 gives us something akin to the first game’s multitude of secret quests, hidden tasks, and mythical rewards, then Bungie will have my hype in a split-second, but in order to maintain that excitement, I’ll also need to know that the destination is going to be as worthwhile as the journey. Do I doubt that any of these things will happen? At the moment, there’s no concrete reason to be pessimistic, despite the long time-scale for the delivery some of these proposed additions. I’m certainly troubled by the fact that the complete sum of Bungie’s roadmap effectively amounts to the return of a lot of lost Destiny features in time for the sequel’s first anniversary – when by that point I was hoping for expansion, not just reinstatement – but I’m staying focused on the fact that all signs currently point to a game going in the right direction. It would be disingenuous of me to not to show willing, now that Bungie is doing so itself. And these changes are being headed up by director Christopher Barrett, who has been one of the most communicative and transparent members of the team of late. And let’s not forget that Barrett’s live team was responsible for steering the first game from its own troubled launch to the triumphant, satisfying, multi-faceted form it took in its later years. If anyone is capable of turning Destiny 2’s endgame around, then those people are working on it right now. I suppose, really, the lessons here are two-fold. The first is that consistent communication between smart, engaged, insightful communities (which, for all the upset of late, the Destiny player-base absolutely is) and developers does work. Players need to ensure to keep passion in check with civility and understanding of course, while studios have to maintain a sense of attentive transparency in order to garner the consistent feeling of trust required to keep that relationship healthy. The recent blow-up has arguably been heated by failures in that respect, but like I said, let’s assume the best for now. And secondly, it’s important, while fielding complaints and requests, for players to focus on what’s really important. The Eververse was a tempting target. Of course it was. But that was partly because it was also a downright fashionable target. It’s being changed, as well it should, but I can’t help worrying that the mass insurrection against Tess Everis’ capitalist empire has rather cast a fog over Destiny 2’s real needs. In time, as Bungie’s improvement plan progressively rolls out, that fog will clear, and we’ll all be able to see the evolving shape of Destiny 2 in more clarity. And hopefully we’ll all be able to inform the ongoing conversation in a way that neatly takes players and studio alike to the place we all want to be. But as we do, let’s employ all of the above, to ensure that we really do get the improvements we need, rather than just fashionable changes. The potential of Destiny 2 is still huge, if managed correctly. But to realise that potential, everyone on both sides of the equation might occasionally need to take a step back from what the immediate, hot issues seem to be, and think of the long-term bigger picture. Because long-term, ultimately, is what Destiny 2 needs to be about.